Pawpaws bloom very early with the earliest forest wildflowers. The blooms are inconspicuous. 1″ to 1 1/4″ in diameter, a deep burgundy red, with a quilted appearance. The fruit is a dull green and blends in well with the foliage. The fruits are hard and have a white flesh until ripe. The flesh, as they ripen, changes from a hard chalky white to golden with a custard consistency. 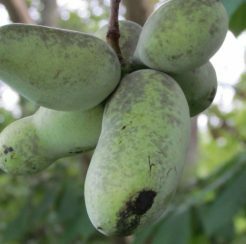 Wildlife find these ripe fruits by their tropical aroma.